whatlisawrote: Hallowe'en - or should that be Mallowe'en?! Hallowe'en - or should that be Mallowe'en?! 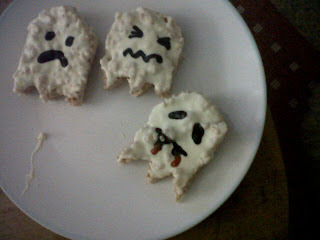 I made 'Mallowe'en' Ghosts the other day for Halloween - fun, freaky and pretty easy to make, these treats were very tasty!! My task now is to make a suitably beautiful birthday cake for my lovely sister-in-law to take to her birthday get-together this weekend. Must get on with looking for recipes!! I will obviously keep you posted on what I make and post pictures.